You know, he's a heavenly bird. He got back in the cage like that. 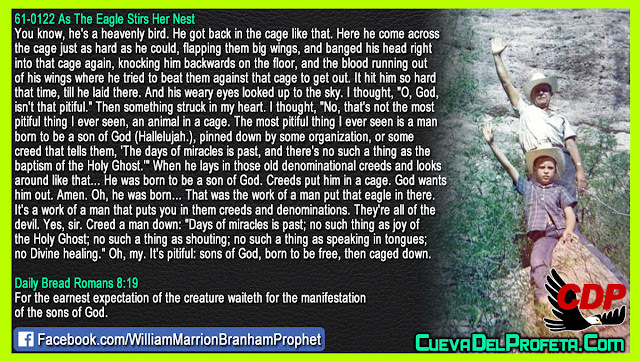 Here he come across the cage just as hard as he could, flapping them big wings, and banged his head right into that cage again, knocking him backwards on the floor, and the blood running out of his wings where he tried to beat them against that cage to get out. It hit him so hard that time, till he laid there. And his weary eyes looked up to the sky. He was born to be a son of God. Creeds put him in a cage. God wants him out. Amen. Oh, he was born… That was the work of a man put that eagle in there. It's a work of a man that puts you in them creeds and denominations. They're all of the devil. Yes, sir. 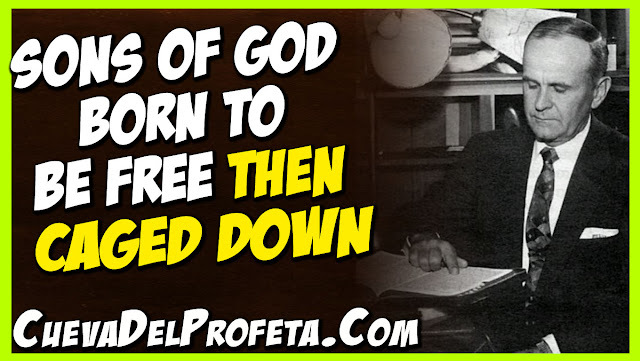 Creed a man down: "Days of miracles is past; no such thing as joy of the Holy Ghost; no such a thing as shouting; no such a thing as speaking in tongues; no Divine healing." Oh, my. It's pitiful: sons of God, born to be free, then caged down.